Atlona isnow shipping its AT-UHD-HDVS-300-KIT, the industry’s first HDBaseT™-equipped collaboration system that provides 4K AV switching, USB and HDMI extension, and system control for PC-based conferencing using Skype for Business®, WebEx®, and GoToMeeting® cloud services. The new two-piece system, which strengthens the company’s standing in the collaboration solutions market, is the industry’s first to enable a single category cable connection between a conferencing hub and a 4K display together with a USB-equipped video conferencing camera, greatly simplifying system design, installation, and daily use. 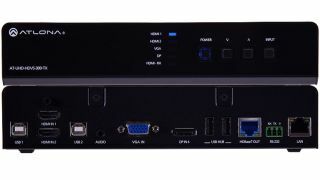 The AT-UHD-HDVS-300-KIT consists of the AT-UHD-HDVS-300-TX, which serves as the conferencing hub, video switch, and HDBaseT transmitter, and the AT-UHD-HDVS-300-RX, which receives the HDBaseT signal and delivers an HDMI signal to the display. The kit extends AV, Ethernet, control, and USB, and includes a USB hub at both the transmitter and receiver. For the AT-UHD-HDVS-300-RX, USB connectivity is ideal for carrying camera video back to the hub. Additionally, a local HDMI input is available on the receiver. “Our hub provides inputs for HDMI, DisplayPort, VGA, and USB microphone, as well as for USB peripherals. Our receiver, co-located with the display, provides inputs to support a USB camera, such as one of the latest generation PTZ models for video conferencing. This new kit is going to have a lot integrators taking a long, hard look at Atlona for their huddle space solutions,” added Castro. The AT-UHD-HDVS-300-KIT is currently available with a suggested end-user price of $1899.99 (US). For more info, visit http://www.atlona.com.